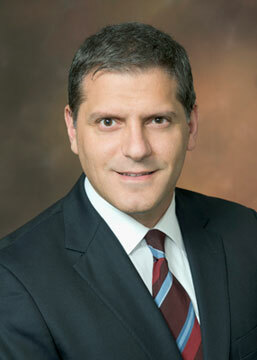 ﻿ Habib Dable, a University of New Brunswick (UNB) alumnus, has been named president of Bayer HealthCare Pharmaceuticals, the U.S.-based division of the global company’s pharmaceutical business. Dable previously held the role of global head of specialty medicine for Bayer HealthCare Pharmaceuticals, overseeing four therapeutic areas for the company: hematology, oncology, ophthalmology and neurology. Dable earned both his bachelor of business administration (‘91) and master of business administration (‘94) from UNB. He joined Bayer in 1994 as a sales representative and has held a number of senior roles in Canada, Japan and the U.S.
“Having spent more than two decades at Bayer in a range of key roles with increasing management responsibility, Habib will be a critical asset as we look to build on our positive momentum in the U.S. to create long-term growth,” said Blake. Bayer HealthCare Pharmaceuticals Inc. is the U.S.-based pharmaceuticals business of Bayer HealthCare LLC, a subsidiary of Bayer AG. Bayer HealthCare is one of the world’s leading, innovative companies in the healthcare and medical products industry, and combines the activities of the Animal Health, Consumer Care, Medical Care, and Pharmaceuticals divisions. As a specialty pharmaceutical company, Bayer Heath Care provides products for general medicine, hematology, neurology, oncology and women’s healthcare. The company’s aim is to discover and manufacture products that will improve human health worldwide by diagnosing, preventing and treating diseases. The University of New Brunswick is Canada's oldest English-language university. Founded in 1785, the multi-campus institution has a rich history and a dynamic focus on innovation, experiential learning and entrepreneurship. UNB has more than 10,500 students from nearly 100 countries while several thousand more take UNB courses online and at partner institutions around the world.